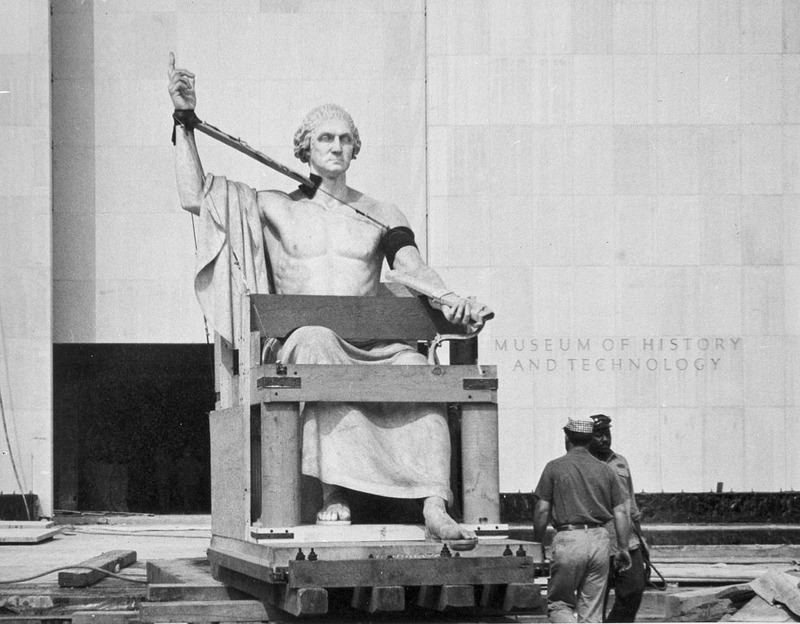 In 1832, to mark the centennial of George Washington’s birth, the U.S. Congress commissioned a statue of the first president. 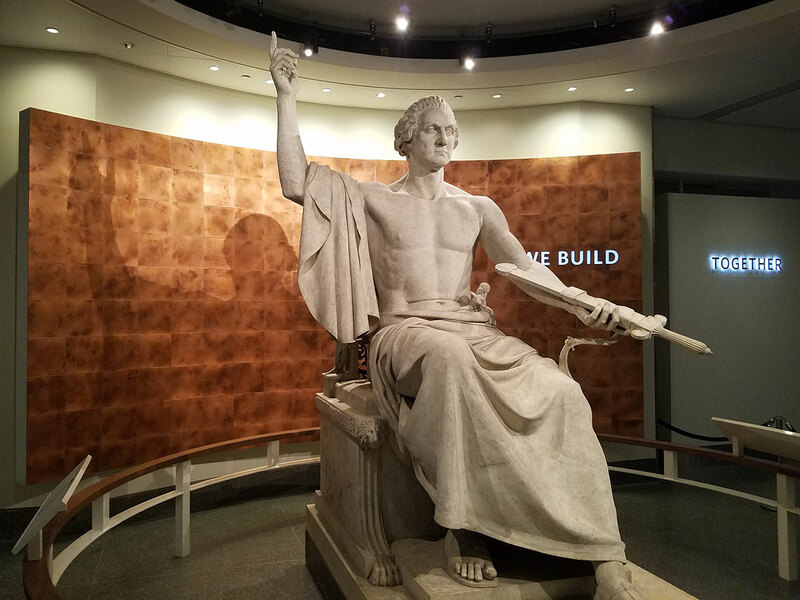 The classically inspired sculpture honored Washington as a leader in war and peace—the victorious general who voluntarily handed his power, symbolized by the sword, back to the people. 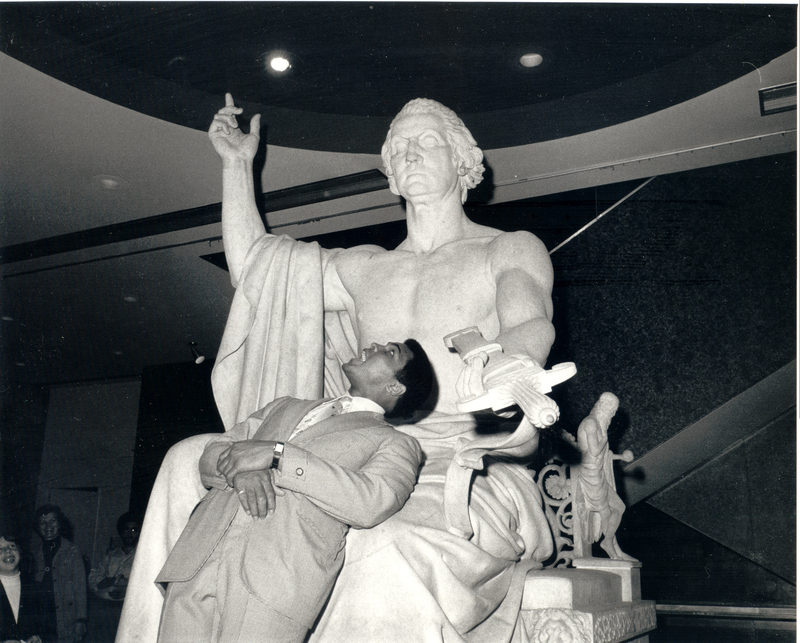 The unconventional statue of the bare-chested and sandaled president was installed in the rotunda of the U.S. Capitol Building, and later the capitol grounds, before it was transferred to the Smithsonian in 1908. 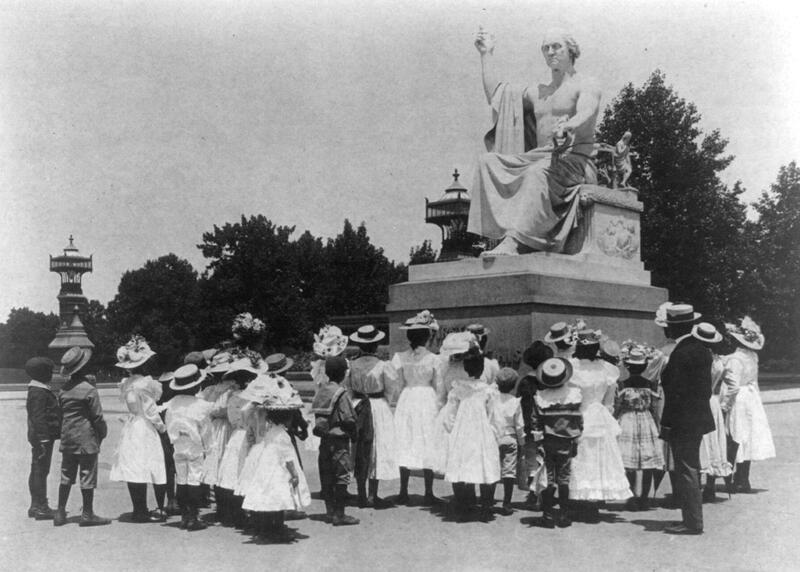 African American school children surround the statue of George Washington on the U.S. Capitol grounds, photograph by Frances Benjamin Johnston, around 1900 (Courtesy of Library of Congress). George Washington’s chair is covered with symbols of a heroic nation. The Greek god Apollo in his chariot represents American enlightenment. Hercules saving himself and his brother Iphicles from a snake symbolizes the perceived courage of the American people. Christopher Columbus and a Native American represent the meeting of the old and new worlds. 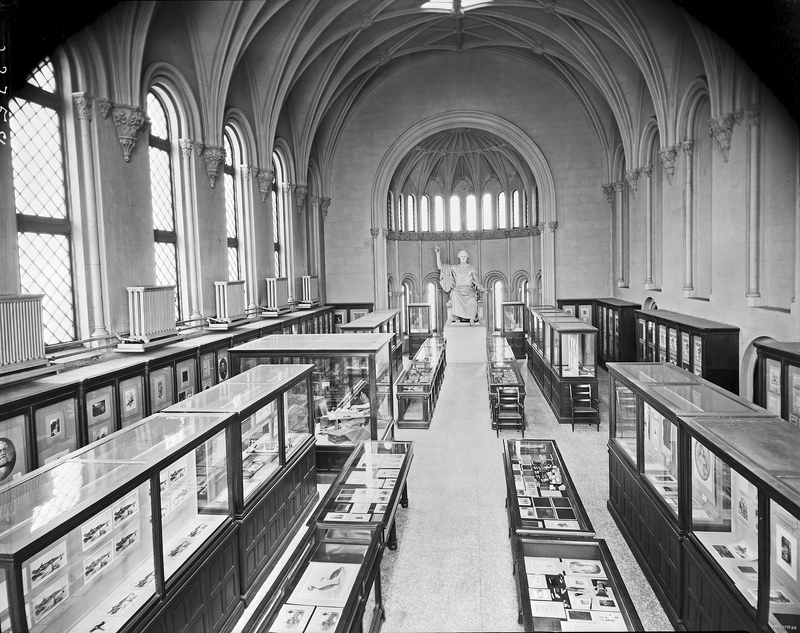 The Latin inscription on the back of the chair reads: Horatio Greenough created this image as a great example of liberty and one which will not endure without it. George Washington spent his life in service to the nation. As a young man he served in the Virginia militia and House of Burgesses. The Continental Congress appointed him commander of the newly formed Continental Army. He led his troops to victory and American independence in 1783. 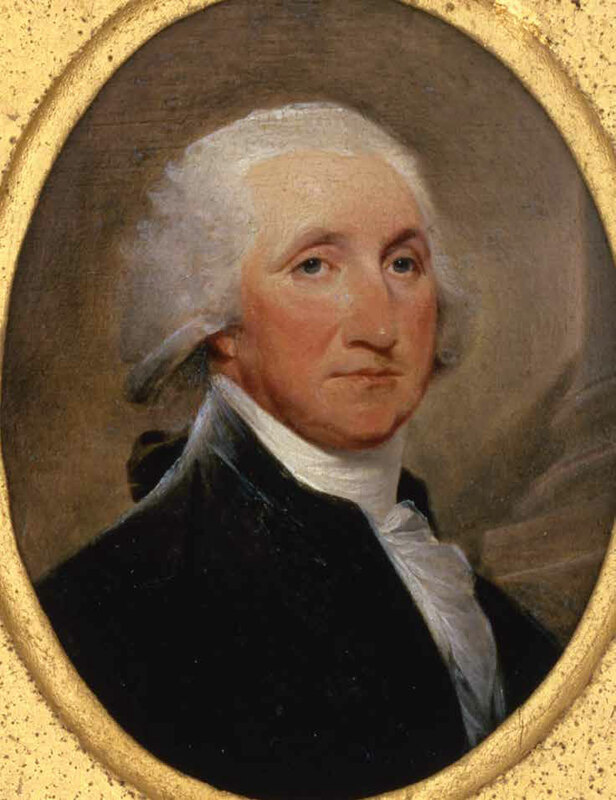 The retired general served as president of the Constitutional Convention in 1787. When the Constitution was ratified, Washington was the unanimous choice for president of the new United States of America. After two terms he again retired to life as a wealthy Virginia planter. The nation mourned when he died on December 14, 1799. 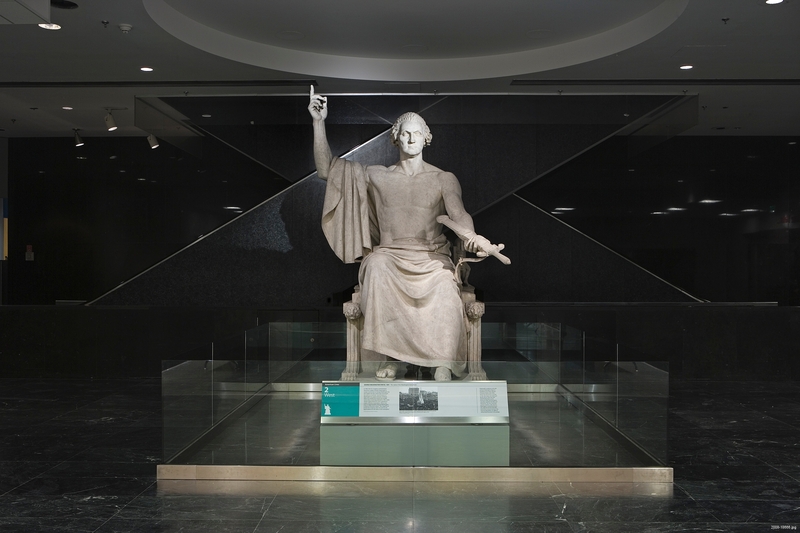 Admired in his time for courage, integrity, and leadership, George Washington became an icon after his death—a man to be emulated and venerated in monuments, celebrations, and epic stories, both real and myth. While Washington can seem a distant figure to 21st-century Americans, and modern scholarship focuses on the fallible man rather than the marble hero, his image is still used for inspiration, patriotism, and commercial gain. 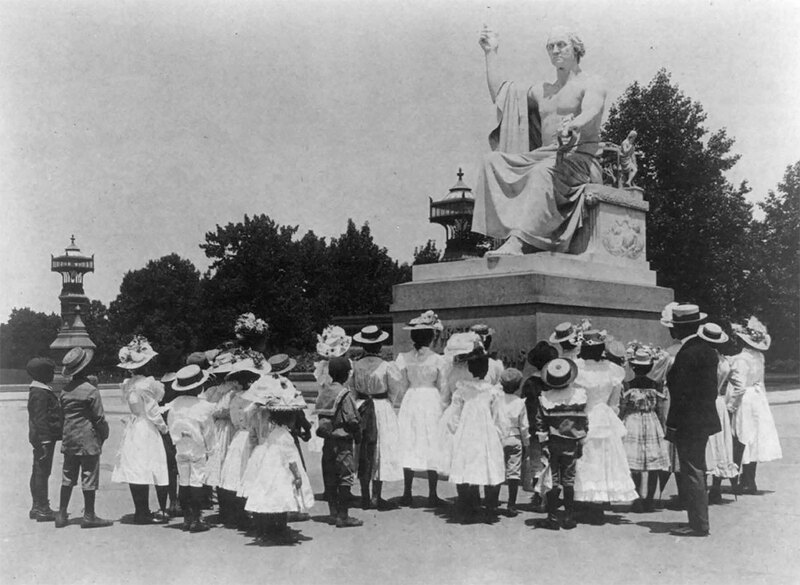 Now joined by modern heroic figures such as Martin Luther King Jr., George Washington continues to hold a place for many as a symbolic “father” of the country.